I want an easy way to calculate the average time an opportunity is open for by sales person without writing any code. 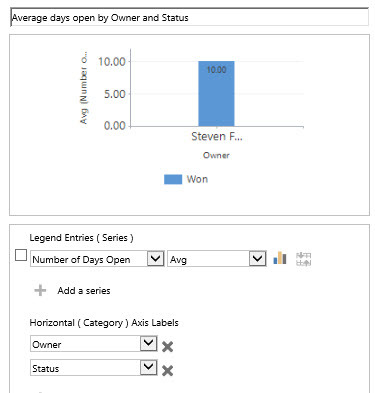 Pre CRM 2015 Update 1, I would have to write some code to calculate the difference in days between created on and actual close date, then use a chart to display average for the sales person. With the latest CRM Online release update 1 a new calculated field formula has been added “DiffinDays” this allows me to calculate the difference between two dates or difference between a date and Now. First of all I have to create a new field to store the actual close date, with the date behaviour set to User Local to match that of the created on date. The out of the box Actual close date is set to Date only which makes it incompatible with created on. 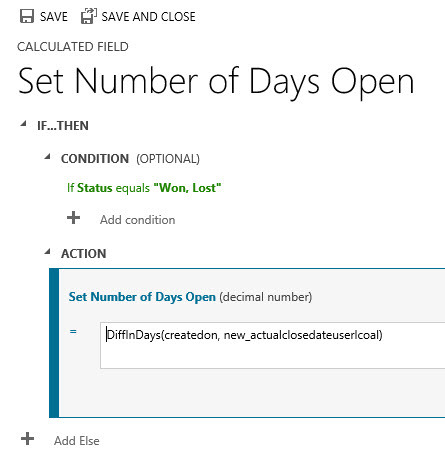 Create a new field named “Number of days to close” as a whole number or decimal. Now you will need to create a workflow to populate your new date field, simple check for actual close date to be populated and then update the new actual close date.